Start every writing unit with formal and informal language! 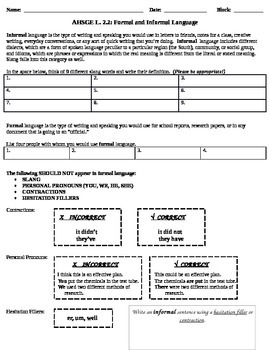 This great resource includes explanations of informal and formal language with examples of when to use each type of language. This packet also includes some fun brainstorming activities and practice activities. 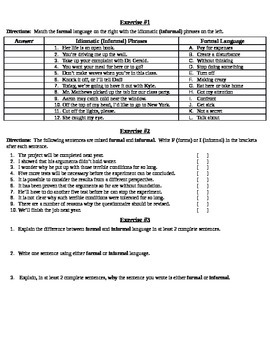 Practice activities include three sections in which students must identify sentences as formal or informal, match informal phrases to their formal counterparts, and reflect upon their understanding/knowledge. I love teaching formal and informal language. I use this activity packet to teach but also to let students teach me a thing or two about the "slang" that they use every day. This packet is guaranteed to inspire learning and laughter in your classroom!